Conecuh County Road Closure – Plus for Hovind? – Kent Hovind v. Robert Baty – The Great Debates! 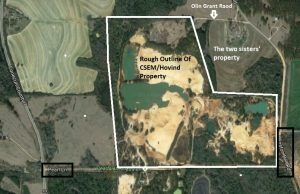 Home→Conecuh County Road Closure – Plus for Hovind? The above is my analysis of the properties involved. It may or may not be an accurate reflection of such. Conecuh county commissioners voted unanimously last week to close a county road near the Dinosaur Adventure Land property at Lenox. During a commission meeting last Thursday evening at the Conecuh County Courthouse, commissioners vote to close the Olin Grant Road, an unpaved road that the county has considered closed for years anyway, county engineer Winston Foshee said. Foshee said that a public hearing was held regarding the closing of the old road, and no objection to its closure was voiced during the public hearing. That hearing, which was advertised for several weeks in the Courant, was held last Thursday and 9:30 a.m. at the courthouse. Commissioner Johnny Andrews, who lives at Lenox, said that, despite rumors going around, the road closure does not include or affect Pearl Lane or the Winston Bell Road. Both of those roads run along the border of the new Dinosaur Adventure Land property, which has been featured in recent issues of the Courant and The Monroe Journal. Andrews added that the request to close the Olin Grant Road was initiated by two property-owning sisters, who were advised to request the road closure by a land surveyor. Newspaper notices announcing the public hearing on the road closure was being sought “in order to maintain security of property.” Those same notices noted that Olin Grant Road begins at an intersection with Winston Bell Road and continues in a southerly direction for about a quarter mile before ending at a residence.